When you’ve decided on the best garden parasol to match your garden furniture, 9 times out of 10 you’ll have to buy the garden parasol stand separately. This is a good and bad thing. The bad thing being of course you’ll have to fork out more money. On the other hand, a garden umbrella stand can add style and class to your parasol and you have the choice to choose which one. Unfortunately unless you’re really good at DIY, a garden umbrella base is a necessity. It basically holds the umbrella upright and prevents it from falling over if it was slightly windy. Without further ado, we’re going to jump right into it. 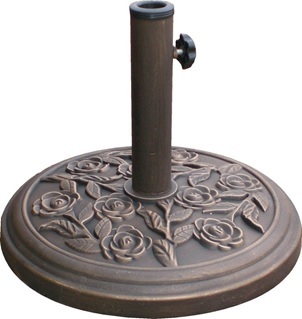 You can see our guidelines on choosing the best garden umbrella stands by clicking here or scrolling past the reviews below. 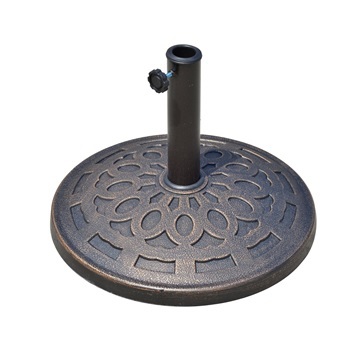 Solid cast iron effect base suitable for most umbrella parasols. Suitable for shafts with diameters of up to 3.5cm to 5cm with the 3 removable collars. Tightening knob to secure the shaft. 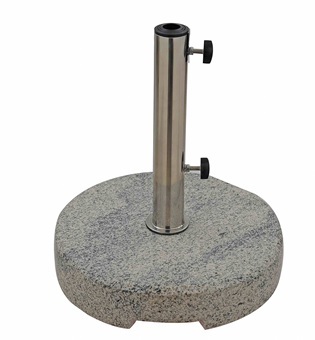 Made from tough granite base with polished finish. Suitable for most umbrella parasols. Stainless steel pole has two tightening knobs to secure the shaft. Will fit pole diameters from 2.5cm to 4.8cm. Heavy and sturdy weighing 25kg to support freestanding umbrellas with a longer pole. Two concrete weighted segments to hold your cantilever and banana parasol in place. Set only includes two segments, a total of four segments are required to securely hold the parasol in place. Segments slot in place to form a round shape. Easier to store away as the segments are divided into four. Each segment measures 47D x 3H cm. Sturdy plastic garden umbrella stand. 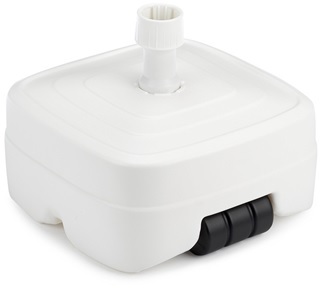 Can be filled with water or sand with a large 45 litre capacity for extra stability. Fits poles between 3.8cm to 5cm. Fixed roller at the base for easy transportation. Measures 47L x 47W x 39.5H cm. 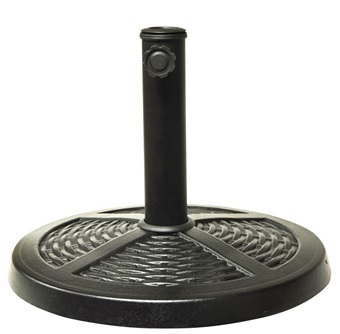 Circular plastic parasol base for your umbrella. Fill with sand or water to increase stability. Capable of holding up to 7 litres of water. Will fit poles with a diameter of up to 3.5cm. 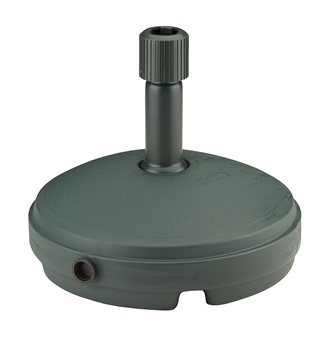 33cm diameter suited for smaller parasols. Very light and storage friendly when empty. 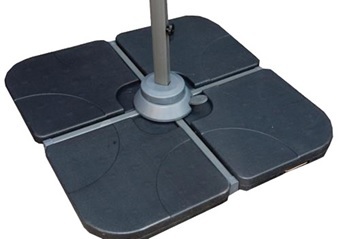 Durable cast iron effect base to accommodate diameters of up to 5cm. Tightening knob to secure diameters of smaller sizes. 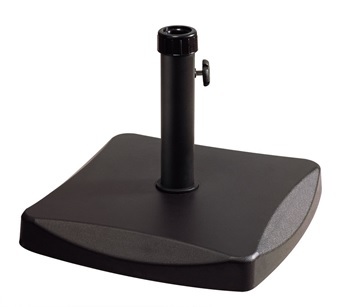 Heavy solid square base capable of securing umbrella poles between 3.8cm to 4.8cm thick. Constructed from tough concrete with an iron 1.2cm thick tube. Sturdy enough to hold an umbrella through the table or freestanding. Has a tightening screw to further secure the pole. Extremely study with its heavy 25kg base. Overall size 48D x 34.5H cm. Very light when empty which makes it easy to store away as it can be divided into smaller segments. Conveniently add water to secure most banana parasols. Fill with water to make a combined weight of 20kg. Each segment measures 48L x 48W x 6H cm. Round durable outdoor umbrella holder. Made of colophony with bronze plastic powder coating. Patterned design to add a touch of beauty. 14kg base weight makes it suitable for taller umbrellas. Round rattan effect parasol base for garden umbrellas. Rattan weave design to match your rattan furniture set. Fibreglass base with black powder steel coated holder. Tightening knob to secure poles up to 5cm in diameter. Dimensions 45D x 30H cm. Depending on what type of parasol you have or will be buying will determine what type of stand you will require. An umbrella style parasol will mean you’ll have to buy a round or square type umbrella stand which has a circular pole in the middle with a slot for the bottom of the umbrella to sit in. With a cantilever parasol base, it’ll be flat and doesn’t have an insert hole for the parasol to slot into. It’s important to know the different types of base materials as this can enhance the look of your garden. Certain styles of outdoor umbrella bases may also be more space efficient which can be a big factor when it comes to storing it away. 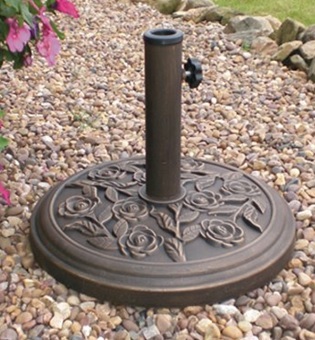 You’ll often come across cast iron parasol bases when it comes to finding a metal base, which is perfect if you prefer to go for the traditional vintage look. In addition to the look, they’re also very tough and durable. Metal bases do not need to be filled with sand or water as its own weight is heavy enough to secure your garden umbrella. As with a metal parasol base, concrete parasol bases are also very solid but can be susceptible to chipping and corrosion. However painting or coating the base will not only allow you to customise the base to match your garden umbrella better but it also reduces the rate of corrosion. Granite, marble and stone bases also falls under this category, these materials are more on the higher end and can add an elegant look. 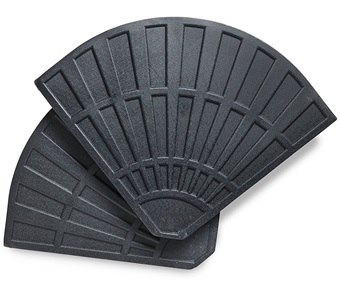 Unlike solid heavy bases, a plastic garden umbrella base has to be filled with either water or sand to have enough weight and stability to hold the parasol. Usually the cheapest option but doesn’t look as appealing as metal or concrete bases. It does come with the advantage of being able to empty out the contents stored inside which then makes it easier to move around and store away.